i was knitting away this past weekend. 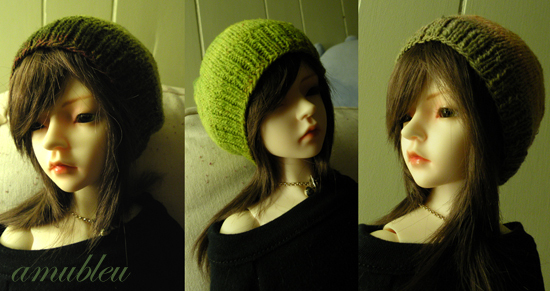 i managed to make three hats with a pattern i was trying to work out. i was hoping to make a slouch hat. the first one (middle one in the photo) had some slouch but not quite enough. i simply made the decision to switch up the needle size after finishing the rib. it worked and the two hat that followed turned out well. i love this yarn. as i knit through the skein each hat becomes totally different from the next. i’m hoping to make more of these with some yarn i’m currently spinning. it’s feels good to not only knit the garment but also the material and tools to make it. checking through my daily reads, danny choo made an entertaining post about going to dolpa yesterday. when you get the chance check it out. some of my favorite doll clothing designers were there. kaba was one of them (love her!!! what i wouldn’t give for some of her clothes) and right after dollshow as well. how do they do it? the dolpas held in japan seem so different from what i’ve seen of the us events. am i wrong to say this? i still haven’t made it to the new york dolpa yet. i was thinking about going this year but could not justify a way to do it with all that’s going on this summer. oh well. maybe next year. …just because «	| » my how you’ve grown, hitomu… um over night?